Christ died on the Cross. But did he fail? Was he truly who he said he was? Jesus Christ laid down his life freely. He had said about his life: “I have power to lay it down, and I have power to take it up again” (Jn 10:18). This is what he did, as promised, on the third day. His “failure” is only apparent. On the Cross Jesus triumphs over sin and its wages: death. The gravity of sin, its effects and Christ’s Redemption correct the superficial view of life that we have of the world. Like all the saints, Newman invites us to look at Christ and consider with sorrow our faults. By sin ‘we have struck the face of God with our hands’ (Meditation and Devotions). We must relearn the gravity of deliberate sin. With immense love, Jesus, who is perfect God and perfect man, atones for our sins. With his love he makes up for our disobedience and lack of love. His death was atonement but the essence of its satisfaction was his total adoration and obedience to the Father. “Christ bears our sins and sorrows. What wipes out Adam’s disobedience is not a punishment laid on Christ’s shoulders thereby satisfying God’s anger, but a moral act of infinite value performed by Christ who, as head of mankind and in solidarity with his brothers and sisters, renders God a homage of total adoration, thereby wiping out Adam’s disobedience (Fernando Ocariz et al., The Mystery of Christ). In the face of suffering and pain we are never alone. We should turn to Christ for strength and peace. Recently at the site of great devastation in the Philippines, Pope Francis invited the faithful to look at Jesus on the Cross and to understand that he stands with them. In addition to repentance for his sins the Christian understands that he should unite to Christ’s sufferings so as to co-redeem with him. 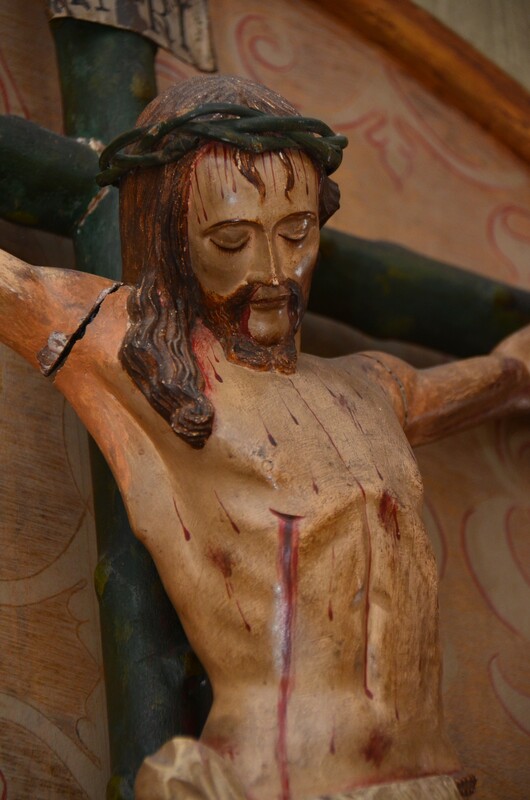 St. Josemaría Escrivá liked to think that Christ on the Cross looks at us and makes a loving reproach: “I suffering, and you… a coward. I loving you, and you forgetting me” (The Way of the Cross). Embracing suffering with Christ is not what a Christian does when all fails; it is foremost an act of adoration and obedience in union with Christ. It is a deeper look at the world and a belief in the power of his Resurrection. Here on earth, in the expectation of the future resurrection, the suffering of the Cross brings with it spiritual joy. “That Cross will lead us to mourning, repentance, humiliation, prayer, fasting; we shall sorrow for our sins, we shall sorrow with Christ’s sufferings; but all this sorrow will only issue, nay, will be undergone in a happiness far greater than the enjoyment which the world gives (…). How then should we look at the Cross and suffering in this life? And with what love and gratitude should we come before the Cross of Christ? Dear Father Juan: I try to read your messages on Linkedin whenever possible for I feel they are extremely helpful for my meditations. We do miss you in the bay area and I’m sure your miss the 70 degree weather that we are enjoying at the present time.